Leonard D. Frazee was born in Illinois in 1870. The 1920 census listed his family at 699 36th Street, with his wife Ellen and three children who were born in Kentucky, Missouri and California respectively. The second child was Leonard Jr. The Oakland business directories list Frazee between 1907 and 1928. At first he called himself a steamfitter, first in Emeryville and, as of 1910, at an address that became 3230 Courtland Street. From the 1914 to 1928 directories he was listed as a heating contractor at 699 36th Street, where he raised his family. In 1919 he was granted half of a patent for an innovative damper design. Frazee died in 1930. I’m not sure if he is related to the owners of the Frazee Paints business, but probably not. This entry was posted on 21 April 2017 at 8:03 am and is filed under Streetscape. You can follow any responses to this entry through the RSS 2.0 feed. You can skip to the end and leave a response. Pinging is currently not allowed. Is this near the Jackson Arms apartments at Bellevue and Ellita? 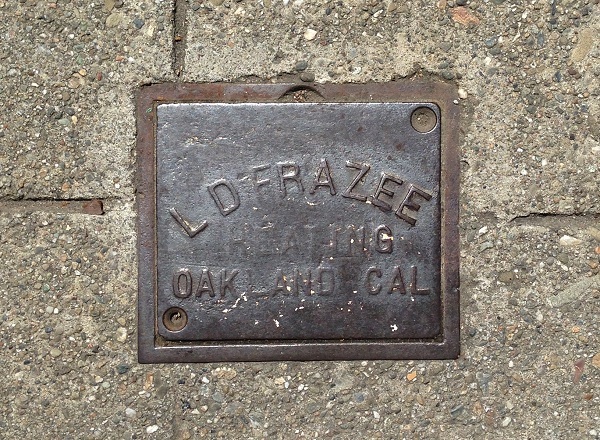 Just working on an Oakland Wiki about the building, and the advertorial from 1924 notes that Frazee did the heating for it. Close. It’s on Lenox Street above Grand.